A new 6-minute video by Jay Staton and Patrick Higgins leads you through the Fakahatchee on all of your electronic devices! As you explore the wonderland of the foliage and wildlife, Patrick’s narration gives a Naturalist’s overview of the Fakahatchee Preserve State Park vast landscapes. Donate to the Boardwalk Expansion! Outdoor Afro hikers check out an orange discovered along the trail. Gators, panthers, black bears, oh my! On October 15th six Outdoor Afros, including Outdoor Afro Miami Leader Ta-Shana Taylor, hiked over 10 miles in Fakahatchee Strand State Preserve as part of a national #UndergroundTrailMode movement. Outdoor Afros is a national organization dedicated to connecting African Americans to outdoor experiences. The pristine swamps of Fakahatchee were perfect for getting in touch with the experience slaves had along the Underground Railroad while braving the wilds of Florida on the way to the freedom of the Caribbean. And boy, did they get the full Fakahatchee experience! Their hike was almost cut short by an angry hissing gator that wouldn’t clear the trail, almost forcing them to turn back around. Luckily, Fakahatchee volunteer Skipper showed up as he was on his way to take well water samples at the Fakahatchee Hilton. He saved the day by driving his truck and encouraging the gator to leave the trail. With the help of Fakahatchee staff, the Outdoor Afros continued to the Hilton where they enjoyed lunch before tackling the overgrown trail that extends even further. On this less-visited portion of the East Tram Trail, they saw fresh black bear tracks and a half-eaten opossum that was clearly someone’s lunch. Their teamwork made handling the thick brush an adventure filled with shared stories, laughs, and smiles. 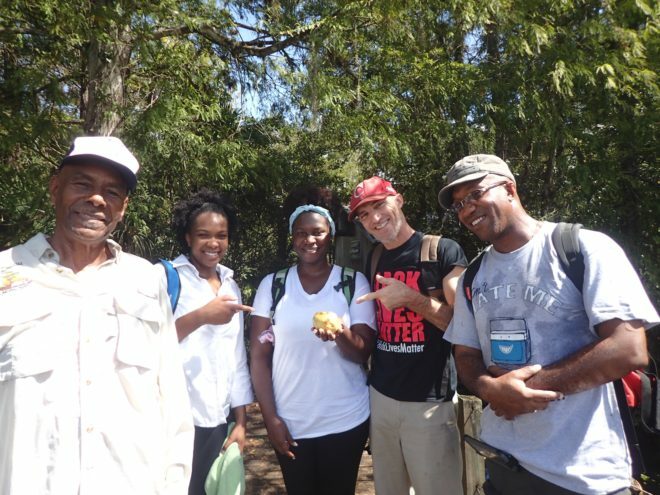 They also enjoyed learning about the edible plants on the trail from Yanique, an Outdoor Afro from Lake Worth who’s knowledgeable in ethnobotany. After hiking 10 miles, their efforts were rewarded with seeing both a panther and a black bear on Jane’s Scenic Drive while leaving the park! The moment passed too quickly to get a picture, but all of the Outdoor Afros agreed that the beauty of Fakahatchee is one of Florida’s hidden gems and a great way to connect to black historical experiences. Editor’s note: Ta-Shana has seen panthers on her last two visits to the Fakahatchee! 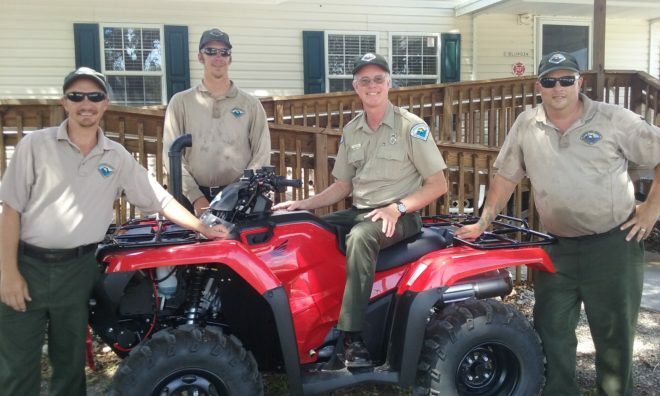 Park staffers admire the new Honda ATV acquired with funds from the FOF annual fund campaign. From left to right are: park services specialist Steve Houseknecht, ranger Steven Bass, biologist Mike Owen and ranger Tom Mosley. A shiny new red Honda ATV is this year’s evidence of the generosity of FOF members who participated in this year’s annual appeal. 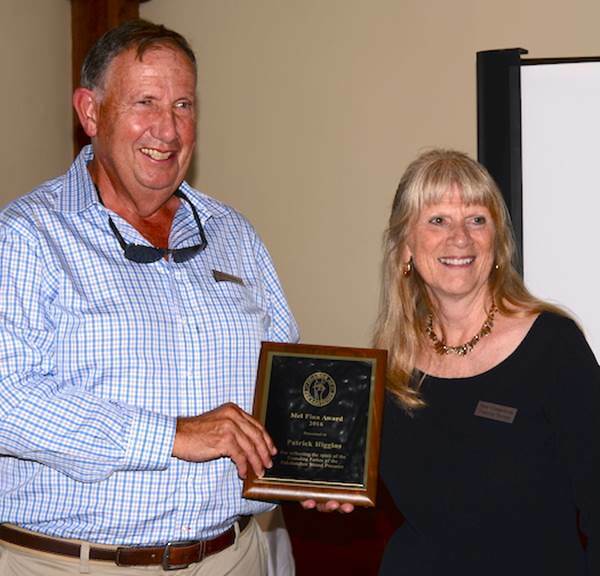 The Board of Directors and the Park manager have identified the need to purchase an all-terrain vehicle to be primarily used by veteran Park biologist Mike Owen and supporting staff. The vehicle became the focus of the 2015 annual appeal launched late last year. 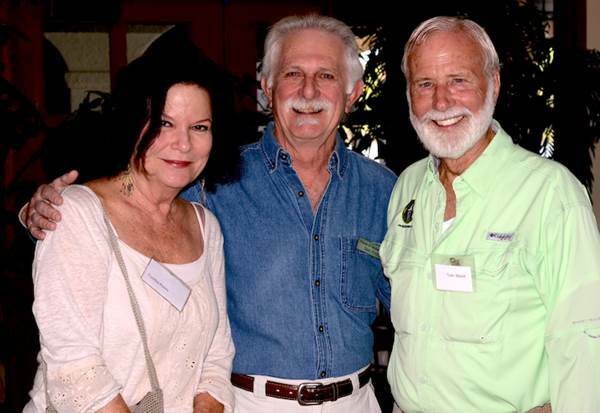 Stevens said the success of the appeal set the stage for another great year for the park and the Friends of Fakahatchee. The Fakahatchee Strand Preserve is a wetland in the Florida Everglades. Recently we had the treat of visiting this wild place. It is one of the most biologically rich places in the United States, and contains many species that are found nowhere else in North America. I have always loved nature, and being in the middle of it. The silence and serene qualities of the “middle of nowhere” are very intriguing to me. The swamp was quite literally, the “middle of nowhere”. I was blown away by how small you suddenly feel as you walk deeper into the swamp. Its beauty can pull you further and further into it, and before you know it, you are lost in a seemingly endless landscape of marsh. As a photographer, the Fakahatchee Strand was the most dramatic environment I have ever been in. Light refracts through the water vapor rising off of the saturated marsh floor, casting long shadows behind trees and plants. Fallen cypress stumps display their ancient architecture that has been etched into their wood by hundreds of years of enduring the watery domain. Water droplets cling to the leaves of bromeliads as a morning dew settles on the plant. Ferns and orchids attach themselves to trunks of pond apple trees. 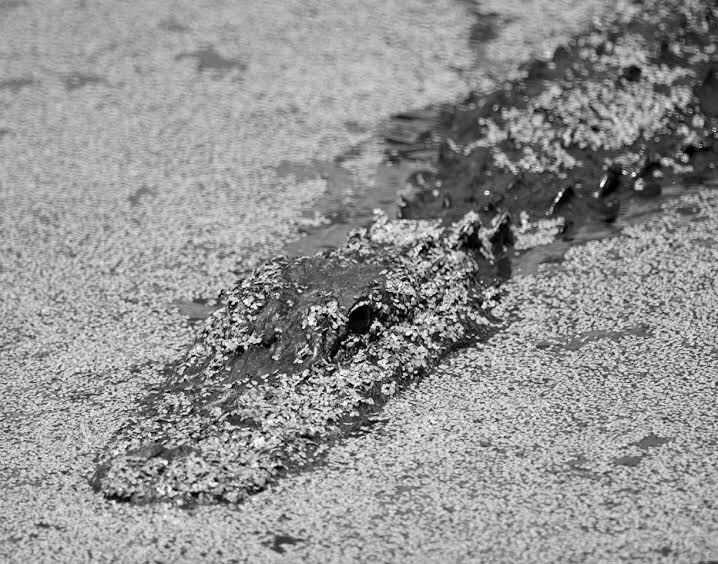 Alligators bask beneath a layer of green slime, patiently waiting for their next meal. There seemed to be an endless number of frames to capture, every square foot of the swamp was special in its own way. I soon realized, however, that I had to pace myself and look for the things that you may walk by without even noticing. It was an incredible trip. I have come away with some amazing photographs, as well as fond memories. Someday I hope to go into this swamp again, and continue to explore more of the 80,000 acres of wilderness. Approximate locations and routes of new sections of the Fakahatchee’s Big Cypress Bend Boardwalk expansion. 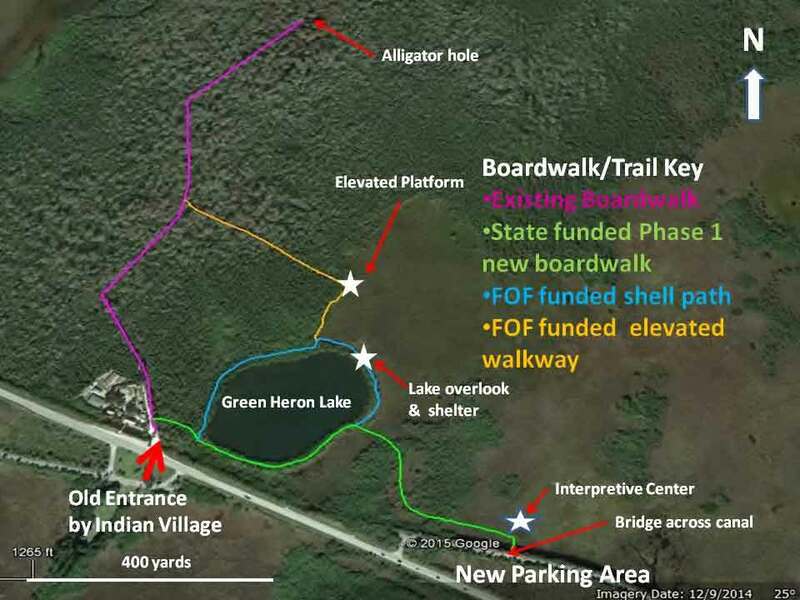 After years of planning, keeping the vision alive, stop-and-go fund-raising and cajoling, Fakahatchee’s Big Cypress Bend Boardwalk upgrade is finally starting. The State has stepped up to the plate and has just advised your Boardwalk Vision Committee that they are now funding the new parking area. In the not too distant future, haphazard parking will be a thing of the past and the porta-potties will be gone too. The new parking area will be created out of an old curve of the Tamiami Trail left over from when the highway was straightened. This is located 400 yards further southeast along Highway 41. The new entrance will be where there is currently an obsolete stop sign and metal gate. As this area is already hard-surfaced, the development will have a minimal environmental impact. The design of this new parking area is 95% complete. The plans include, for the first time, gated access to the Park with a fee collection point, parking for 65 cars, an open-sided picnic pavilion, proper restrooms, and a campsite for resident volunteers, as well as a bridge across the canal. The bridge could be a major feature itself and will lead to an interpretive center nestled on the wet prairie and a new low level boardwalk (shown in green on the attached diagram) connecting to the start of the current Boardwalk. According to the State’s Bureau of Design and Construction, the design and permitting will be completed before year’s end. Groundbreaking is slated for January 2016. When it’s complete, access from the current ad-hoc parking by the Indian Store will be severed, and that area re-landscaped with native plantings. Part of the overall plan is a deceleration and turn-lane off Highway 41. 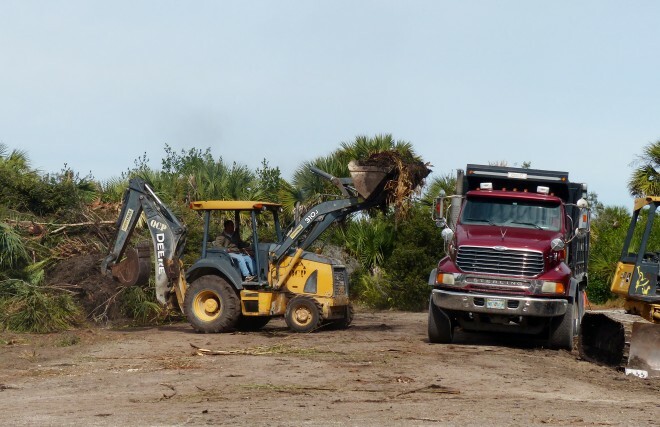 Funds for this have been now been transferred from the Florida Department of Revenue to the Department of Transportation, facilitated by the Boardwalk Vision Committee who have been keeping all the disparate elements of the State and local government machinery in the loop. This aspect will be completed as part of the US 41 resurfacing project. Your Boardwalk Vision Committee can add two other feathers to its cap. The first feather is the likely elimination of a concrete sidewalk that was going to parallel US 41. The second is State funding for the first new boardwalk section (green on the diagram) on the other side of the canal. It will lead to the south side of the Lake and come out near where the picnic table used to be by the Indian Village. Originally, in the bargain struck last year, FOF was going to be responsible for everything on the other side of the canal. FOF will now only be expected to fund the new interpretive center, the stroller/wheel chair accessible crushed shell path (in blue), a covered observation deck at the top of what we’re calling Green Heron Lake, and the link from there (shown in yellow) to the middle of the existing Boardwalk. Earlier plans also called for an isolated observation tower out on the wet prairie. Latest thoughts are to replace this with a gradually elevated (maximum 1:20 pitch ) fully ADA compliant section of the boardwalk leading to an observation platform some 20 feet up right on the boundary of the Strand and prairie. This elevated section would be parallel to the edge of the Strand but set back just inside it. A thin line of naturally occurring trees and shrubs will mask it from view as it is approached from the lake and salt marsh/wet prairie. It would gradually reveal a view across the salt marsh/wet prairie and the interior of the Strand. No section of it would be visible from the existing Boardwalk. FOF is still also responsible, in partnership with the Park, for the overall interpretive planning for the whole expanded site including the contents of the visitor center, interpretive signage and displays. Planning for this is well underway via our Consultants, the Acorn Group, who are producing an interpretive prospective for us. It should be complete in July 2015, and will be an important tool in our fund raising activities. Watch this space for news of our new capital campaign and further details of the plan.